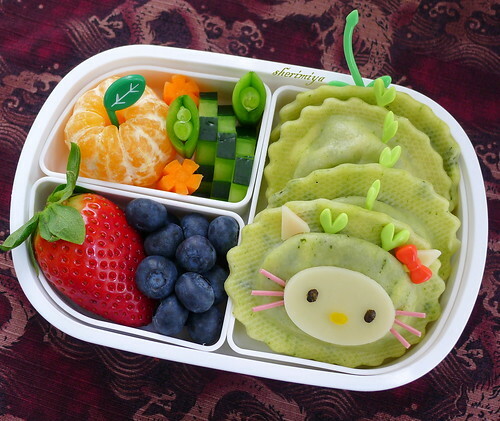 Hello Kitty Dragon Bento, a photo by sherimiya ♥ on Flickr. Since this was a no-cook bento I took advantage of the extra time to use a Chinese New Year theme. Since 2012 is a Year of the Dragon, today's ravioli are shaped into this mythical creature -- or rather, Hello Kitty dressed in a dragon costume. She's wearing a spinach-ricotta ravioli mask, her face made of cheese, nori and yellow pepper. Her whiskers are ume somen. I used picks liberally to achieve my charaben objective, showing that you can use ready-made items (and a bit of imagination) to reach your desired decorative goal. This bento was for MisterMan, and I realized that it was probably more appropriate for TinySprite, but he didn't mind. The girls teased, "You're eating Hello Kitty!" The rest of the bento includes: baby tangerine, cucumbers, carrot, peapod, strawberry and blueberries. Chinese New Year falls on January 23rd this year. Gung Hay Fat Choy! I love it! Very creative as always Sheri! Eeep! Hello Kitty dragon is so so cute!! Your bentos are all so beautiful! I have been wanting to package my lunches bento-style since I first stumbled upon your blog a year or so ago--I have yet to fully commit, but your creations remain inspiring :) Happy Chinese New Year! Thanks so much for the sweet comment Jo! I get lots of inspiration from other bentopackers too. I hope you can enjoy your own bento creations soon! Very creative and love your bento color! That is one of the most precious and creative theme bentos ever! The dragon costume is so precious, I love the use of the picks. What a clever, clever idea to use ravioli as a dragon...!!! I need to think of a theme for my Chinese New Year bento too :)!! Thanks mama elaine, Chantale, Ceinwyn, Natakiya, CG and karaimame!! two !! i would love one as well when you come out with a book! hahaha ^___^ i absolutely LOVE this bento... it's soooo cute !!! ^______^ HK ROCKS ! Whaaat... this is way too cute. My daughter will love this one. HOw do you come up with so many ideas?! You should host a bento camp for moms who want to make bento like this. I'll be the first one who will register! HK loves dressing up for CNY! Nami, HK in bento is an instant no-fail hit. That's bento lesson #1. Bento camp sounds fun! I want to go too, heh ^_^! I was saying that I love your blog. I'm new to Bento, and coming to it out of bore with lunch making for my family. Where do you get your accessories? Specifically, the little items like leaves and hats you poke into food to characterize it.